As directory services join in the movement to the cloud, there are certain considerations that must be taken into account. One of the most foundational needs is the ability to integrate with critical IT resources. Many applications today are located in the cloud, and having native integrations are critical. One extremely popular solution that is used in the enterprise is G Suite™. This productivity tool is used in businesses of all sizes, and integration with this tool can be vitally important for some companies. 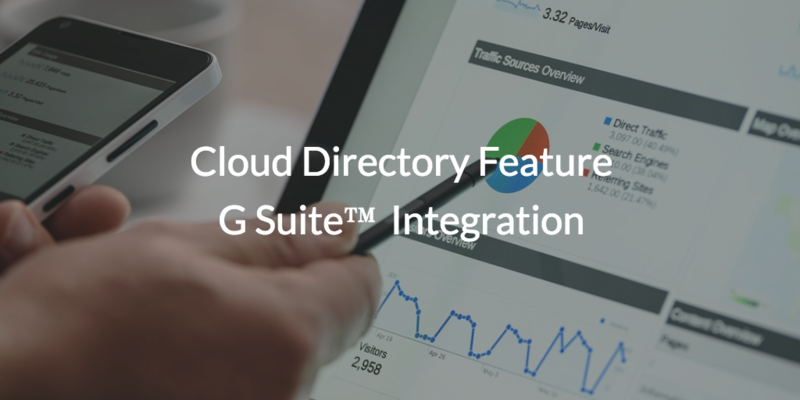 That is why in this post we will be talking about the cloud directory feature G Suite integration. G Suite burst onto the scene about a decade ago, and it has been bringing in customers ever since. It first emerged by the name of Google Apps, and it was debuted as a way to eliminate on-prem Microsoft Exchange, Office, and Windows File Server. It quickly became a huge hit, and has continued to grow over the years. In fact, over 4 million businesses now use the platform. The challenge with G Suite is that it doesn’t have an accompanying directory service that helps manage the Google identities. There are Google user management features that are located within G Suite directory and Google Cloud Identity, but these tools are largely limited to managing access to Google Apps and a few select web apps. It’s hardly a comprehensive solution. Google’s assumption has been that the on-prem directory service, Microsoft® Active Directory®, would continue to be the identity provider of choice for IT organizations. In fact, they built an integration tool called GADS (now called GCDS) to be the identity bridge between on-prem Active Directory and G Suite Directory. But we are now seeing that trend going away. In today’s IT environment, most admins want to shift their entire IT infrastructure to the cloud. Ideally, the G Suite instance would replace most of the productivity platform, and a cloud version of Active Directory would replace the identity provider. In this setup, admins could finally have the full cloud environment they want, instead of the one foot in the cloud, one foot in on-prem directories like Active Directory forces. This is where a next-generation identity management platform comes in to play. 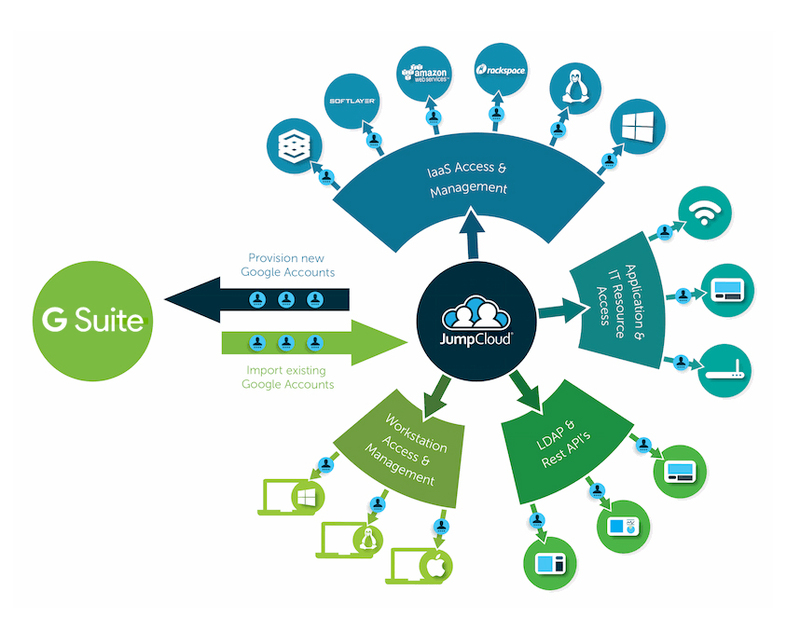 This cloud-based directory, called JumpCloud® Directory-as-a-Service®, is able to act as the cloud replacement to Active Directory IT admins have been searching for. And, with it’s tight integration to G Suite, Directory-as-a-Service is enabling IT organizations to completely move to the cloud. JumpCloud’s cloud directory feature G Suite integration is huge because it enables the centralization of identities. With G Suite integration, IT admins simply need to manage their user identities within the cloud directory, and from there all of the changes are federated to G Suite and Google Cloud Platform. Users can be provisioned, deprovisioned, and modified from Directory-as-a-Service to G Suite via the tight integration. 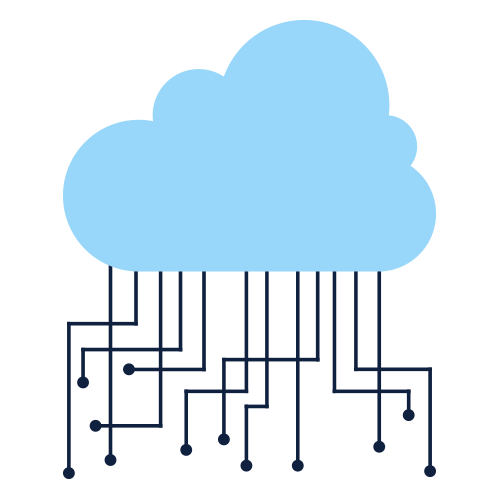 In fact, a user’s Google Cloud Identity or credentials can even be leveraged as the identity used to access Mac, Windows, or Linux systems, cloud or on-prem servers (e.g. 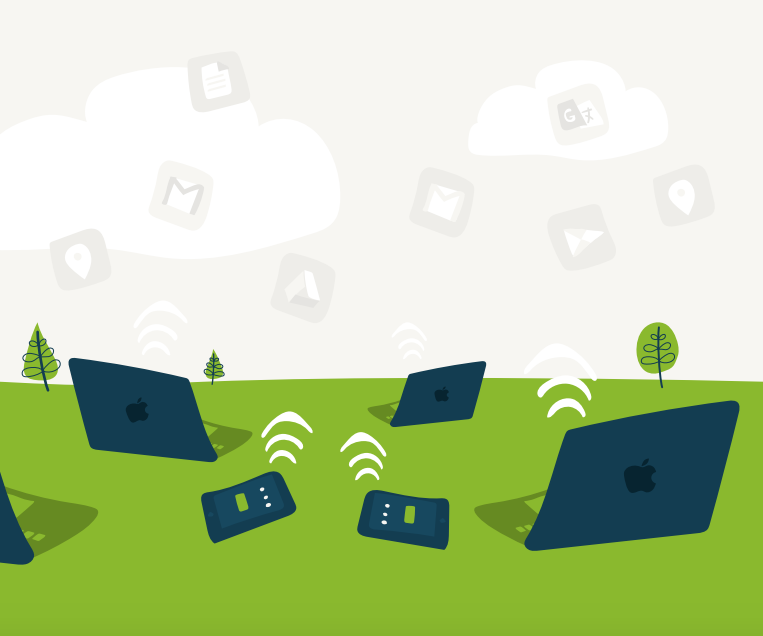 AWS), web or on-prem applications via LDAP and SAML, virtual or physical file servers (e.g. Samba file servers and NAS appliances), and wired or WiFi networks. It’s True Single Sign-On™ built for the modern era of IT. Sound like a feature you might be interested in? Then check it out for yourself. JumpCloud offers free accounts with 10 users to everyone, that don’t even require a credit card to start. Our goal is to give you the ability to test out the platform, so the free account even has full access to the platform. You can sign up here. Want to see a demo instead? You can do that too. We have weekly webinars that discuss the various features of the platform and allow for live interaction. Finally, if you ever have any questions make sure that you reach out to us. We are always happy to help in any way we can, so don’t hesitate to give us a shout!